Have any of you heard of these? I tried to delete released songs, b-sides, rumered songs, songs written for proteges, etc. Yes, I've heard most of these songs. There are lots of released stuff still on your list, and many of the unreleased songs have been bootlegged. But that said, there are still things on it I'm unfamiliar with. Yes, most of those titles are familiar. Do Your Homework. (Actually, that one is new to me.) But I admit it's a lot of work. Yo Mister, for instance, was a hit by Patti LaBelle in 1989, but I can understand a young fan not knowing that. Same for And How which was given to Jevetta Steele for her album Here It Is in 1991, together with Skip 2 My U My Darling. And then two years later that same album was rereleased on a different label with two different Prince songs on it, Hold Me and Open Book. Collecting Prince can be a confusing affair! And there's more examples. 51 Hours is an unreleased dance/house track by Diamond & Pearl. Can't blame anyone for not having heard it (and you don't miss much). The Exodus album is quite hard to get, so titles like DJ Seduces Sonny (it's not a song at all, just a segue) might seem mysterious to someone who doesn't have it. Having said that, there's still plenty of unknown stuff here. I'd love to head a song called Endonesia. ANd so forth. 90% of that stuff is out already. I don't know how long ya been a Prince fan (everyone starts somewhere of course), but much of that stuff is well known. Especially stuff like Rosie, or the singles for "Cream" etc. Yes, most of those titles are familiar. Do Your Homework. (Actually, that one is new to me.) But I admit it's a lot of work. Yo Mister, for instance, was a bit by Patti LaBelle in 1989, but I can understand a young fan not knowing that. And there's more examples. 51 Hours is an unreleased dance/house track by Diamond & Pearl. Can't blame anyone for not having heard it (and you don't miss much). The Exodus album is quite hard to get, so titles like DJ Seduces Sonny (it's not a song at all, just a segue) might seem mysterious to someone who doesn't have it. Having said that, there's still plenty of unknown stuff here. I'd love to head a song called Endonesia. Great stuff! Unfortunately, I'm not a Young Fan... Ever since I borrowed a copy of my friend's 1999 tape and played it secretely with my WalkMan circa 1983!!! CHILD! WHAT?! You triggered me on that. I had a shiny new Walkman around that time. I loved it because it pushed together to be more compact - about the size of a cassette case. You pulled the long sides away from each other to allow for the tape to be inserted. It also exposed the battery casing. 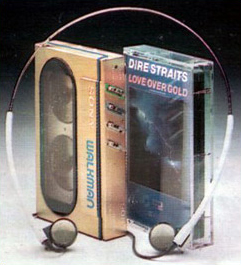 It was one of the first Walkmans with Dolby noise reduction on it. The earphones were a new design, too and the first I ever saw with the green band on it. It ran on one double A battery. A secondary design had a burgundy strip (where the blue was) and included an AM/FM radio. It was $100 at Service Merchandise. I was just enamored with it. Thriller never sounded so good on it.